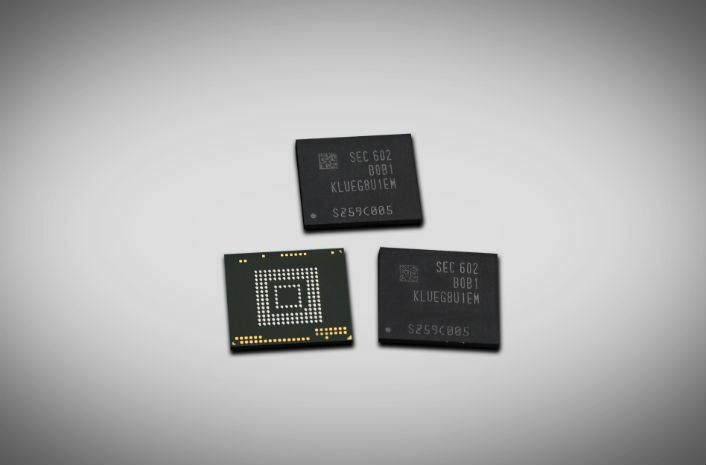 Samsung is gearing up to mass produce the first ever 256GB embedded memory module as a Universal Flash Storage 2.0. Performance is a big advancement over the recent SATA-based solid-state-drives used in high-end PCs. The UFS memory from Samsung offers ultra-fast speed storage based around their V-NAND flash memory chips. The UFS memory is capable of performing 45,000 input operations and 40,000 output operations each second. The UFS memory is twice the speed of the previous UFS memory type. The latest version uses dual lanes of data transfer to create speeds of 850MB/s which is approximately twice the speed of SATA-based SSDs. For sequential writing, the speed is lower at 260MB/s. One of the main benefits of the latest version of 256GB UFS memory is that it will better support playback of 4K video content. Tablets now have split screen display technology with 4K video playback that can be combined with a second area of the screen being used to display an app. This tends to push the hardware to the limit. With 4K video, the data read needs to be faster because a 4K video contains so much more compressed image and audio data. This audio/visual data needs to be read, decompressed and played in real-time. Samsung has just gone into full production of their UFS memory 2.0 chips which will become available later in 2016.